This simple tutorial shows you how to install the Sublime Text 3 in Ubuntu 14.04 Trusty LTS via PPA repository. 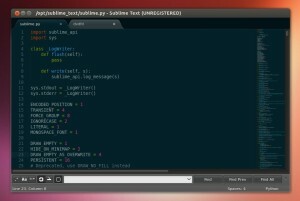 Sublime Text is a popular text and source code editor somewhat similar to TextMate, available for Windows, Linux, Mac OS X. Thanks @Lorin, but both commands now do the job in Ubuntu. Both versions do indeed work just fine. I’m still getting Cannot add PPA: ‘ppa:webupd8team/sublime-text-3’. even after adding -E. I’m using over proxy. Devashish, Thanks! it helped me. Yes, it works!! But, how can I remove from title console the “UNREGISTERED” word?? Do you know how to install Sublime Text to use with NCL from NCAR?? Thanks for the commands. It perfectly worked for me. r is not in the sudoers file. This incident will be reported. Thanks Ji M, it worked just fine on my Ubuntu 14.04 Server.